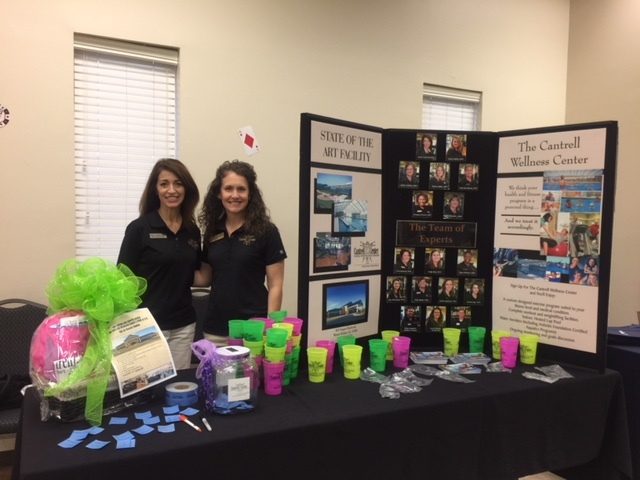 On Thursday, Nov. 9th, 2017, the Cantrell Center participated in the City of Warner Robins Employee Health Fair. Physical Therapist, President, & CEO of the Cantrell Center, Tassie Cantrell, along with Jessie Tanner, Exercise Physiologist and expert Trainer at the Cantrell Center, talked to many city employees about their health and answered questions about some of the physical challenges they face. Whether checking meters for the utilities department, having a desk job, or fighting fires and protecting our city, these wonderful people have physical concerns that challenge them daily on the job. They were all very receptive to and appreciative of the ideas we gave to make them more physically fit and ergonomically safe. The event took place at the Wellston Center from 7:30 am to 1:00pm. 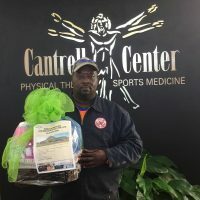 Derrick Lofton was the lucky winner of the Cantrell Center drawing for a two-person “Buddy” membership at the Cantrell Wellness Center which includes full access to the pool and gym as well as classes. Many thanks to the City of Warner Robins for all the wonderful jobs they do each day. Also, many thanks to our Mayor, Randy Toms for recognizing the need to provide workers with valuable information and everything from flu shots to hearing tests, to physical well-being screenings and information by hosting this great event.